Due to the explosive popularity of Virtual Reality and 360° video, a professional quality virtual tour should be on the radar for every business as a valuable marketing tool. 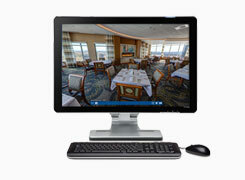 New technology has made the virtual tour experience more accessible and engaging than ever before. We capture sharp high resolution full 360° panoramas in high dynamic range (HDR) and deliver them in custom tailored mobile first web applications for your audience to enjoy them on desktop, mobile devices, and even in VR headsets. 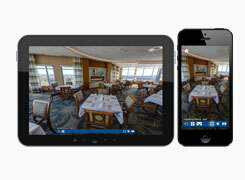 All of our virtual tours are optimized with mobile first design principles. Most iOS, Android and Windows phone devices are supported with easy to use touch UI. 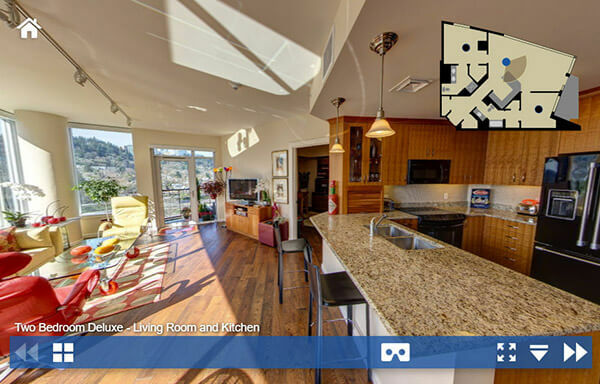 Viewers can click and drag to explore the virtual tour on desktop computers while viewing 360 images in the highest resolution. Viewers with Google Cardboard, Samsung Gear VR, Oculus Rift and other popular VR headsets will be able to experience your virtual tours like they are really there! Great sound design makes scenes feel more realistic, providing an immersive experience. Allow viewers to get a closer look at your products and services with photo galleries. We can take your schematics and design custom floor plan navigation. Background music can add ambience and life to any scene. Google Maps or Bing Maps can be integrated for wayfinding or navigation. For a guided tour feel, we can integrate professional VO, and offer the recording studio services. 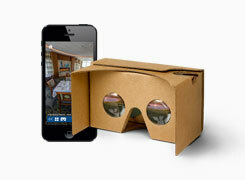 Embed video from YouTube or Vimeo directly inside the virtual tour. Whether it’s buying a product or learning more about a service, your virtual tour can drive conversions. Intelligent meta tagging allows for beautiful eye-catching social media posts of your tour. Through Street View and the Street View app, Google allows you to publish interactive walk-throughs of any business or place directly on Google Maps. When customers or prospects search for your business, these images appear alongside your listing, enticing viewers to look inside and explore. 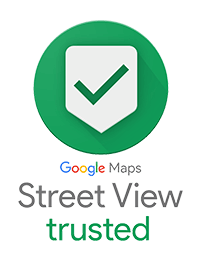 We've been certified Street View | Trusted photographers since 2012. As experts in the Google ecosystem, we can help you get the most out of your custom Street View tour with amazing high quality HDR 360° panoramic views with seamless coverage from floor to ceiling. While others attempt to optimize this service with consumer grade cameras in the name of speed, we strive to produce the best quality we can, not cut corners! Every business has a different tour need, big or small. We're here to help you plan the best experience for your potential customers.